Classroom management can make or break your teaching. But as educators know, there is no one-fits-all solution for every classroom. 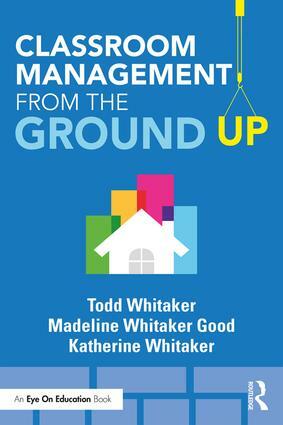 That is why bestselling authors Todd Whitaker, Madeline Whitaker Good, and Katherine Whitaker came together to write this book. They created a guide combining sound research with practical wisdom so educators could have a classroom management resource written by teachers for teachers. From this book, you’ll gain effective strategies for designing and improving your classroom management from the ground up. You’ll learn how the three core aspects of classroom management (relationships, high and clear expectations, and consistency) can be used to build and maintain an effectively-run classroom. You’ll also find out how to tweak minor issues and reset major challenges when things don’t go as planned. Each chapter covers a core aspect of classroom management and includes a foundational understanding of the concept, powerful stories and examples, how-to applications, and tips on tweaking as problems arise. In addition, each chapter features a "What You Can Do Tomorrow" section--strategies you can implement immediately. Whether you are a new or experienced teacher, this book will empower you to identify what is going well, adjust what needs to be changed, and feel more prepared for the unexpected.